Want to take a very bizarre vacation? Not worried about putting a trespassing arrest on your record? Pennsylvania’s Raven Rock Mountain Complex might be the destination for you. The United States built the mysterious Raven Rock Mountain Complex in the early 1950s, to allow for the continuation of the U.S. Government should a widespread nuclear attack occur. The site can hold 3,000 people comfortably, and there are rumors that amenities include a fully-stocked Starbucks on site, and a tunnel to Camp David. But what's the truth about Raven Rock, and what's a big stinking lie? Devised and built soon after the USSR successfully detonated its first nuclear bomb in 1949, Raven Rock Mountain Complex is just outside the small town of Waynesboro, Pennsylvania. While the position is obscure, the out-of-site location is within close proximity to the Pentagon, the White House, and Camp David. Originally, Raven Rock was designed to house high ranking government officials and up to 3,000 individuals for 30 days should a global catastrophe occur, as part of the United State's Continuity of Government Plan during the Cold War. While the site likely does not maintain enough supplies to house 3,000 people in the post-Cold War era, Vice President Cheney probably "hunkered down" in Raven Rock during the weeks following September 11th. Currently, Raven Rock is known by several names, including Site R and the Alternate Joint Communication Center. And Raven Rock contains everything necessary to carry on key communication services and allow for Navy, Air Force, and Army decision-making, should dialogue cease or a rapid change in the chain of command within the United States Executive Office occur. Furthermore, it shall be unlawful to make any photograph, sketch, picture, drawing, map or graphical representation of the Pentagon Reservation and Raven Rock Mountain Complex without first obtaining the necessary permission. The facility does appear on Google Earth — but you can't find it with a direct word search. What is at Raven Rock? If you happen to be in the area, you can get reasonably close, but don’t expect to be able to enter the complex. Several civilians live in the rural homes surrounding the complex. I would consider that a super-safe zip code. At least four stadium entrance-like portals dot the outside of the facility, portals that burrow directly into Raven Rock Mountain. Height-wise, Raven Rock is closer to a hill than a mountain, as the summit of Raven Rock is a little over a kilometer high. Near the top of the mountain lies a high-powered communications array, to carry out the facility's current mission of maintaining lines of communication with all branches of the military. Once inside the complex, word-of-mouth accounts paint a picture of a small city built inside a cave-like environment. At least 5 three-story buildings are present, with the buildings connected by a series of roads accessible by car. Due to the nature of the sixty-year-old underground base, far-fetched rumors about the facility abound. One of the less bizarre rumors suggests that there's a tunnel to the nearby Camp David, but there's no evidence to support the tunnel's existence. Raven Rock garnered its own parody website - whitehouse.gov1.info - which touts souvenir coins, guided tours for visitors, and claims the facility has a fully-stocked Starbucks on the premises. Raven Rock also plays a role in the video game Fallout 3, a role harkening back to the facility's Cold War roots. In Fallout 3, the Raven Rock Mountain Complex is the home of the Enclave, the last vestige of the United States government. While rumors abound, the Raven Rock Mountain Complex is a necessary site in the world climate we live in. The fact facility can be found via Google Earth takes away some of its mystique — but the compound remains practically impenetrable, and for good reason. Top image is of two possible portals into the Raven Rock Mountain Complex, with the satellite image via Google Earth. 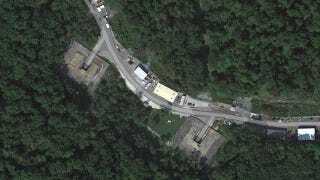 Second image is a satellite image of a communications array near Raven Rock via Google Earth. Sources linked within.